Bettys and Taylors of Harrogate, also known as Bettys and Taylors Group Limited, is a family company based in Yorkshire, England. 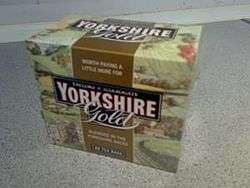 The company's brands are Bettys (with no apostrophe), Taylors of Harrogate and Yorkshire Tea. Bettys Café Tea Rooms are traditional tea rooms serving traditional meals with influences both from Switzerland and Yorkshire. 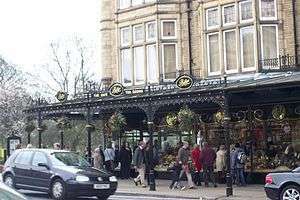 Taylors of Harrogate was a family tea and coffee merchant company, founded in 1886, which blended Yorkshire Tea and Taylors of Harrogate Coffee; the owners of Bettys acquired Taylors in 1962. Bettys products are handmade and use high quality ingredients, usually sourced locally. The current chairman of the company is Lesley Wild, solicitor, designer, author and wife of Jonathan Wild, the great-nephew of the founder Frederick Belmont. In 2007 Bettys and Taylors was 72nd in a list of "the 100 best companies to work for" compiled by The Sunday Times. The first Bettys tea room was opened on Cambridge Crescent in Harrogate, West Riding of Yorkshire, by Frederick Belmont, a Swiss confectioner, in July 1919. 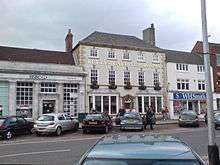 The Harrogate tea rooms later moved to their current position on Parliament Street. Belmont arrived in England at King's Cross railway station able to speak little English and losing his document with the address of his destination. After approaching many passers by, an old gentleman who spoke a small amount of French managed to tell him where he was going, Bradford. Belmont returned to King's Cross shouting "Bradfat" at any railway station official he could find; eventually he managed to board the correct train to Bradford. In the 1920s, Belmont opened a craft bakery in Harrogate, which meant it was possible to open more tea rooms, including a York branch. The origin of the Bettys name is unknown. The company's website suggests four possibilities: Elizabeth Bowes-Lyon, mother of Queen Elizabeth II (which seems unlikely as she did not come to public prominence until marrying the Duke of York in 1923); Betty Lupton, former manager of the Harrogate Spa; the daughter of a previous occupant of the Harrogate premises who died of tuberculosis; or a small child who interrupted a meeting at which the choice of name was being discussed. The merger with Taylors of Harrogate (founded 1886) came about in 1962. In 2001 Bettys opened a cookery school on the same site as their craft bakery, at Plumpton Park near Harrogate. Bettys marked their 90th anniversary in July 2009 with afternoon tea of patisseries, fancies and cakes from the past served by waitresses dressed in period costumes. The St Helen's Square café in York was inspired by the magnificent RMS Queen Mary cruise liner and became particularly popular during World War II when the basement ‘Bettys Bar’ became a favourite with hundreds of American and Canadian ‘Bomber Boys’ who were stationed around York. ‘Bettys Mirror’, on which many of them engraved their signatures with a diamond pen, remains on display at the branch today. 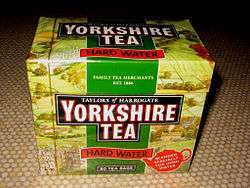 In 1962 Bettys joined forces with another Yorkshire business, family tea and coffee merchants, Taylors of Harrogate, who still manufacture Yorkshire Tea and Taylors of Harrogate Coffee. Until 1976 there was a Bettys tea room in Commercial Street, Leeds in premises now (as at February 2008) used as a mobile phone shop. There was also a tea room in Bradford, on Darley Street. Bettys have refused many times to open a branch outside Yorkshire, claiming that keeping Bettys small means a watchful eye can be kept on every detail. ↑ "Our brands". Bettys and Taylors Group ltd. Retrieved 8 August 2014. ↑ Simms, Jane (November 2008). "Profile: Jonathan Wild". Director Magazine. Retrieved 19 July 2010. ↑ "Bettys and Taylors". The Sunday Times. London. 11 March 2007. Retrieved 5 May 2008. ↑ "Mysterious Betty of cream teas", The Yorkshire Post, 21 July 1979. ↑ "About us". Bettys Cookery School. Retrieved 31 August 2011. ↑ "Bettys Café Tea Rooms in St Helen's Square, York celebrate 90th birthday". York Press. 15 July 2009. Retrieved 15 July 2009. ↑ Greenhalf, Jim (1 October 2012). "Sad as Acropolis cafe bites the dust". Telegraph & Argus. Retrieved 8 October 2012. ↑ "Bettys brews up a record £10m profit following year of growth". The Yorkshire Post. 6 July 2013. Retrieved 7 September 2016.